Coloring Pages / Bible Stories / Prayers / and much more ! Bible-Printables is designed to be an augment to your Bible study, Sunday School or VBS Class. Our goal is to provide Bible lesson leaders with resources to help them provide the best Bible Lessons possible. Our drawings help you teach, (for Pre-K thru5, Middle School, Young Adult and "older" Bible class learners) by providing visual and textual materials around the specific events within a bible story. The bible coloring page drawings highlight the key elements of the bible stories. Many bible stories (text) are also included and the associated visuals can be selected to complement the clase age and maturity level. Review our collection of Bible story coloring sheets, Bible Story sheets, Prayers and Graces, and activity sheets. Bible "teachers" (lesson leaders) are encouraged to print as many as you need for your class, or you may combine these with other materials to build you own lessons. We do ask that you NOT reproduce our images / stories/ materials for any project that will will be offered for sale or published on the internet. Printable Bible Coloring and Activity Pages are fun to use in Sunday School Classes and Vacation Bible School and make teaching lessons fun and easy! Bible stories are the preferred teaching method and content of most Sunday school and VBS classes. It can sometimes be a challenge to find the materials you need and coordinate the story with related activity sheets. That's where we can help ! Finding prayers, devotions, and blessings can be time consuming and even a little intimidating. Thats why we have collected and made available many of our favorite classic prayers and devotions here to share with you. Bible song sheets are great activities for all ages. Most of us have sung these songs hundreds of time, but we still need a little "memory-booster" to make us feel comfortable and confident to sing them with a group. Fear not, the answer is here, just print out your favorite classic bible song, hymn or rhyme and pass them out to you Sunday School or VBS class. 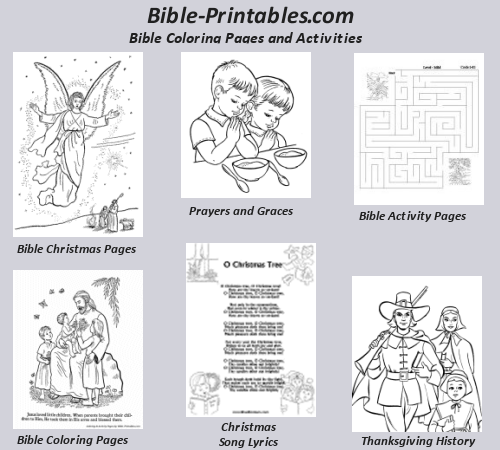 Bible-Printables: Bible Coloring Pages and Activity Sheets! The goal of this site is to provide assistance to Christian parents, volunteers, educators, Sunday School teachers, VBS councilors, and individuals involved in church-program delivery. Many activities at Vacation Bible School (VBS) are perfectly augmented with the use of printable youth activity sheets, or coloring sheets. Printable bible coloring pages are quick and easy to produce for any size class or group with little preparation required ahead of time. Coloring and Activity books are great education tools to help students create a visual/mental link with the story being taught. For these reasons, bible coloring sheets and activity sheets have become an excellent bible education tool. Coloring sheets have been in wide application usage by church educators and bible-school leaders as educational tools for many years. Many Pre-K through 5th grade sunday-school classes use of coloring pages and printed activity sheets to illustrate their lessons. Pre-K classes might focus on coloring simple church themes and objects, while the older youth classes can progress to more complex scenes to illustrate the new or old testament. Bible Coloring Pages for children is a wonderful activity that encourages children to learn about Christian history thru Bible stories. Bible-Printables provide these educational resources for Sunday School teachers, home schoolers, and VBS counclors as tools for Christian youth education. Beyond the Bible educational virtues, these Bible coloring and activity sheets provide and augment fun development activities for young Christians. While many of our pages are simple for young learners, there are also many pages that are highly detailed and include detail stories and text for older learners. Bible coloring and Activity pages are a fun way to teach Pre-K thru early elementary kids about Bible traditions in Sunday School and VBS. We encourage teachers and care givers to print these Bible Coloring pages for their students and us them in many fun and creative ways! These Bible coloring pages are free for student and educational non-profit use and may be printed for your Bible teaching / learning enjoyment! Bible Coloring and Activity pages are a fun way to learn about the our Christian Bible traditions, and learn coloring and drawing too! Share these Bible Coloring and Activity pages with your friends!